Wainscot - MITRE CONTRACTING, INC. Here is some information on a project we just finished installing this month. This homeowner wanted her foyer updated and enhanced with a wainscoting for more architectural appeal. This wainscot treatment gives a lot more depth and detail than the simple one piece chair rail that was existing. These pictures were taken right after the installation, so they show the product before any caulking, puttying, or painting. The walls have to be repaired in the places were the old chair rail was installed. You can see the way the previous "carpenter" had run the chair rail straight into the stairway... basically killing it into the floor, when it should have followed the angle of the stairs. Click here to view some other styles of wainscoting we have installed! 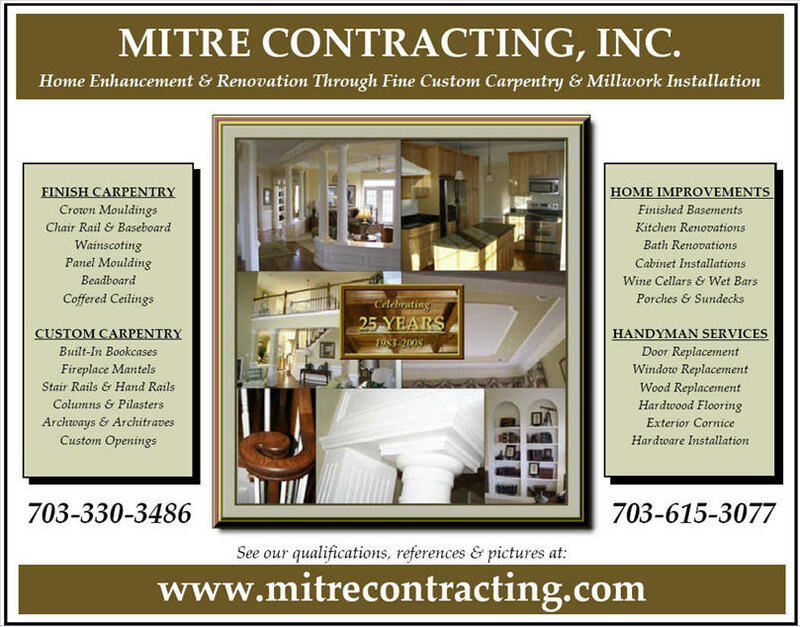 If you live in the Northern Virginia Area, please call or email us anytime if you would like us to come to your home and give you a free, no pressure, no obligation, consultation & proposal, for your next home improvement project. Whether it is to upgrade your mouldings, install new stair railings, or renovate that old outdated bathroom or kitchen, let us help you design and build the space of your dreams.